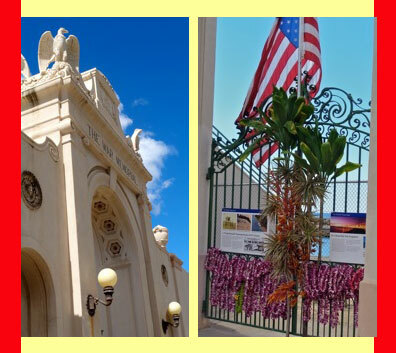 On the eleventh day of the eleventh month at the eleventh hour in 2014, Veterans Day ceremonies were held at the Waikiki Natatorium War Memorial to honor the 101 selfless individuals who died and the 10,000 military service personnel from Hawai`i who proudly served during WWI. Kahu Silva, a Viet Nam War era veteran, had the honor of offering the opening remarks and delivering the formal invocation of the program. 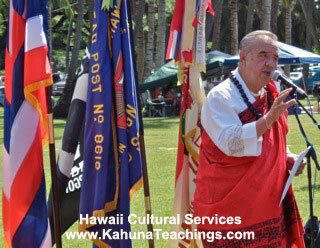 Rich in cultural symbolism and island tradition, his presentation included a commemorative tribute that metaphorically compared the bravery and valor of Na Koa Mua (Hawaii’s veteran warriors) to the noble qualities of the highly prized (acacia) Koa. May the memory of all of all of Hawaiiʻs brave soldiers live long like the Koa trees that stand proudly.